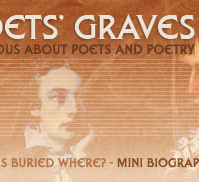 After the death of William D'Avenant, Dryden became the first official Poet Laureate. 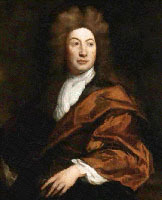 However, following the Glorious Revolution of 1688 (when William and Mary succeeded to the throne) Dryden, who had become a catholic, lost his position as Poet Laureate to his arch enemy Thomas Shadwell. 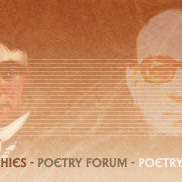 Dryden satirised Shadwell in his poem MacFlecknoe - referring to him as the heir to the kingdom of poetic dullness. 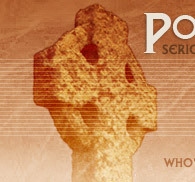 (MacFlecknoe was almost certainly a major inspiration for Alexander Pope's Dunciad). 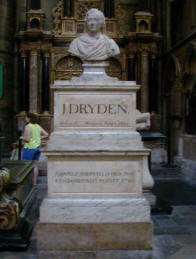 Dryden was one of the leading neo-classical (Augustan) poets - along with Swift, Addison and Pope. In an attempt to move away from the work of the Elizabethan poets they drew inspiration from roman poets such as Ovid, Horace and Juvenal. Portrait of Dryden by Sir Godfrey Kneller Dryden's poetry is characterised by a witty satirical style - as in Absolom and Achitophel (1681) - although he did write some religious verse such as Religio Laici (1682) and The Hind and the Panther (1687). He was also a prolific playwright although today his plays are not highly regarded. 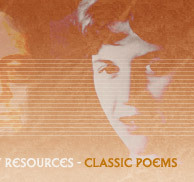 In his final years Dryden supported himself and his family by translating the classics such as Homer and Virgil. He died at 43 Gerard Street, Soho.